Planning a baby shower is a lot of fun, but can definitely be a lot of work. 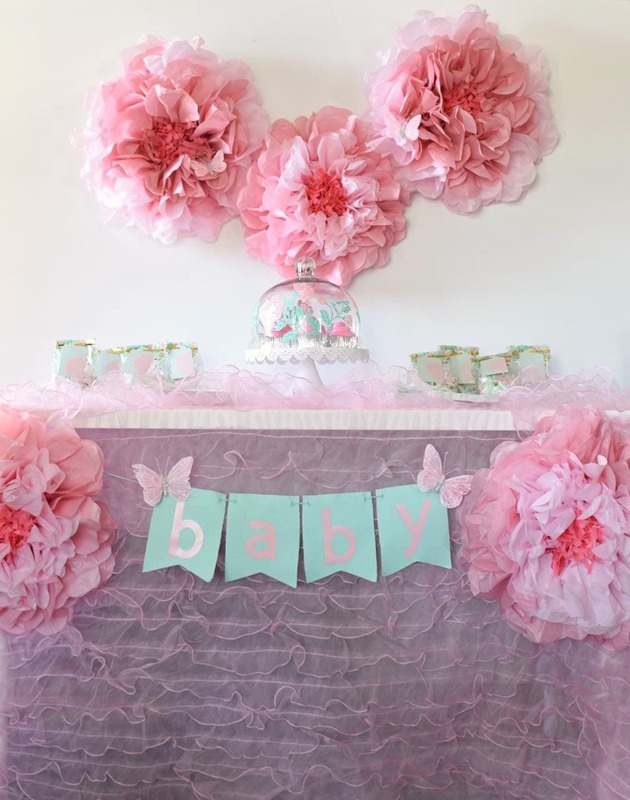 Today I’m sharing some adorable girl baby shower ideas with you that are perfect for a pretty pink baby shower! 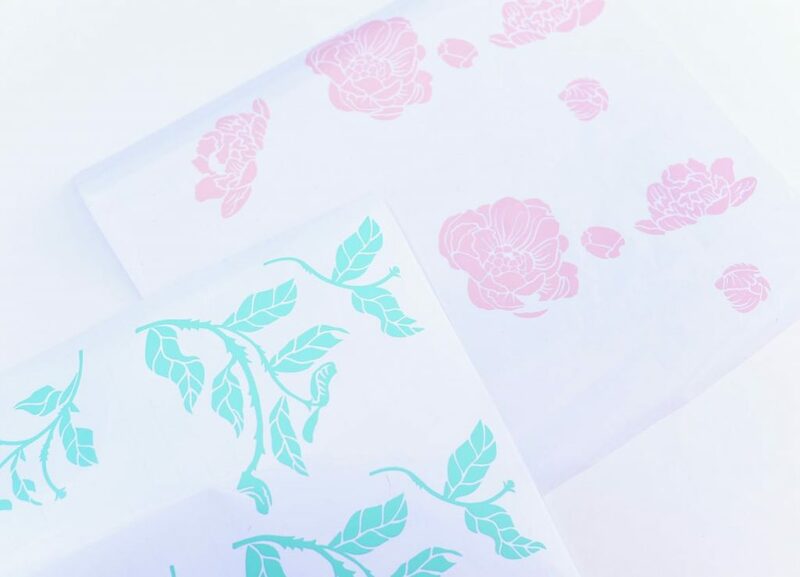 I’m also sharing the cut files for a few of these projects to make with a Cricut machine, so if you have a Cricut (or have a friend with one), you’re in luck! Your life just got a whole lot easier. 😉 If you don’t have one yet, keep reading and you’ll see why a Cricut machine is so amazing. 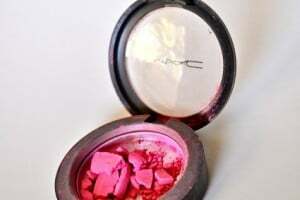 Having just had a baby girl five months ago, I still have all things baby and girly on my mind. I wanted to create a floral baby shower in pink and mint, so I decided to used Martha Stewart’s Mint & Blush party supplies, sold exclusively at Michaels. 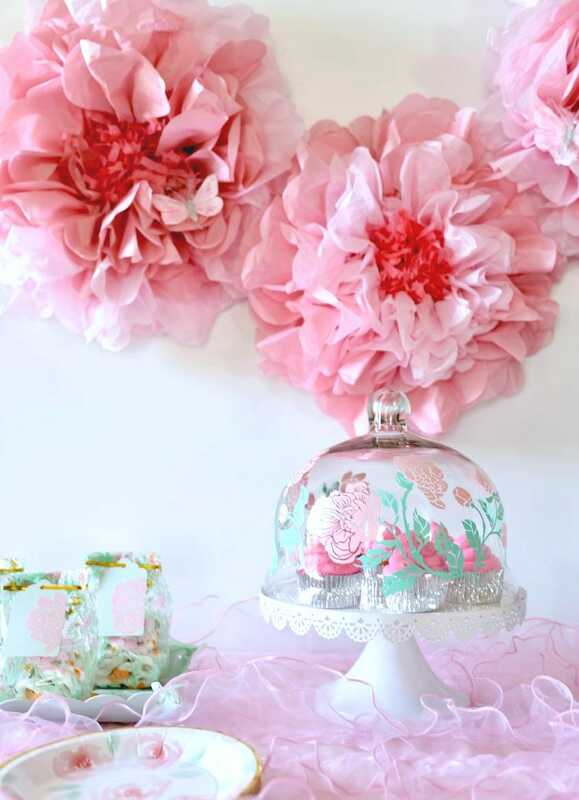 These supplies are all coordinated perfectly, which makes planning a baby shower a breeze! 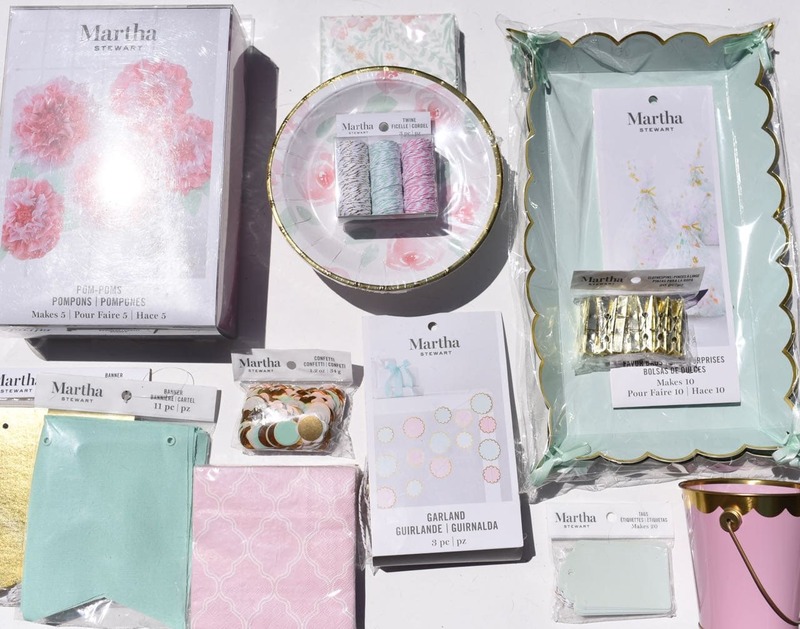 There are 10 different themes in the Martha Stewart Celebrations line, so you can find the perfect supplies in all different colors that are just right for your next party. 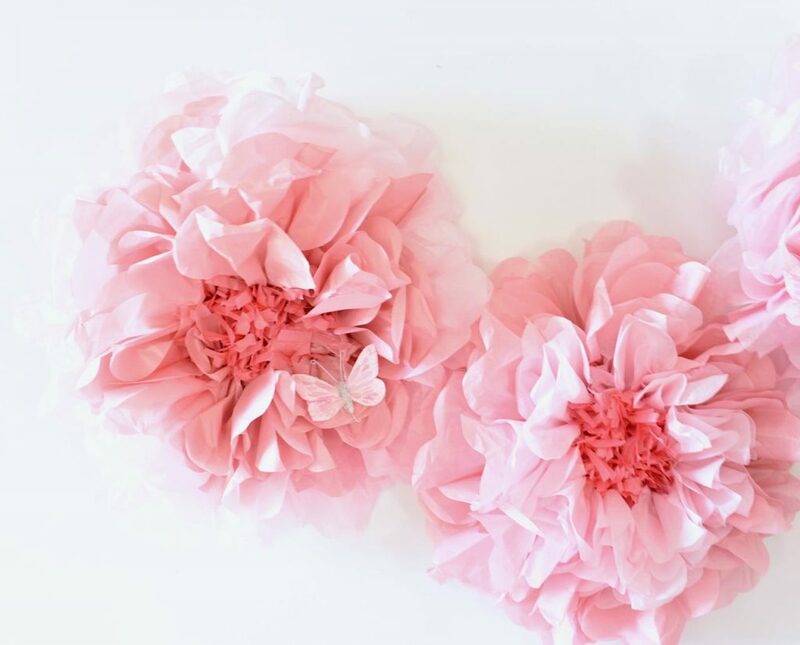 The big tissue paper flowers for the backdrop only look complicated, but were actually very simple to make! I used tissue pom poms that were already pre-cut and folded. I just had to fluff them up to make these pretty flowers. I made a batch of strawberry cupcakes with a homemade pink butter cream frosting piped on top. 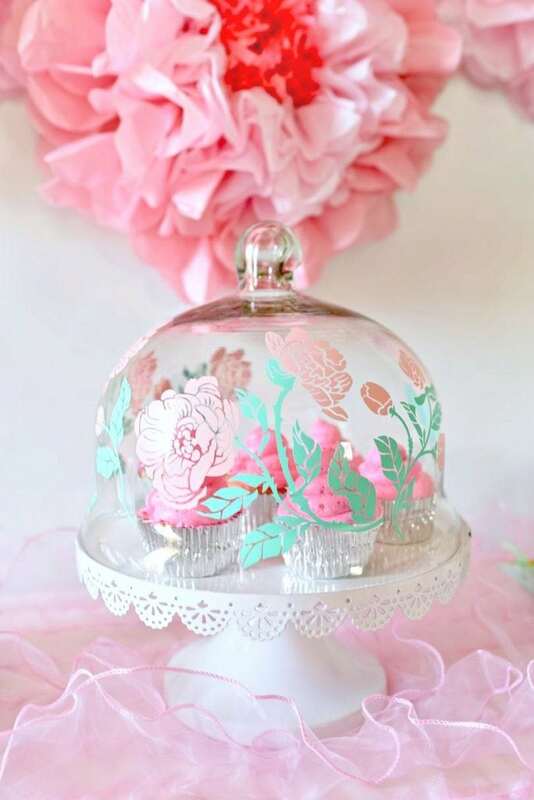 I wanted to dress up the cake stand glass dome top that went over the cupcakes, so I cut some vinyl with my Cricut® Explore Air™ 2 Special Edition, Martha Stewart Machine Bundle. The flowers are so pretty and match the rest of the party perfectly. 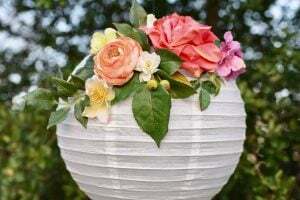 The flowers were cut using pink and blush Cricut vinyl. You can get the flowers cut file HERE to make your own! I filled pretty floral bags with white chocolate covered pretzels, then folded the top down. I attached a gorgeous mint tag with a vinyl blush flower on it with a gold tie. Can you believe the details on the tag? I used the same flowers I used for the cake dome I just shared, except I used half a flower on each tag and removed the stems and leaves. You can find the cut file HERE to make your own. 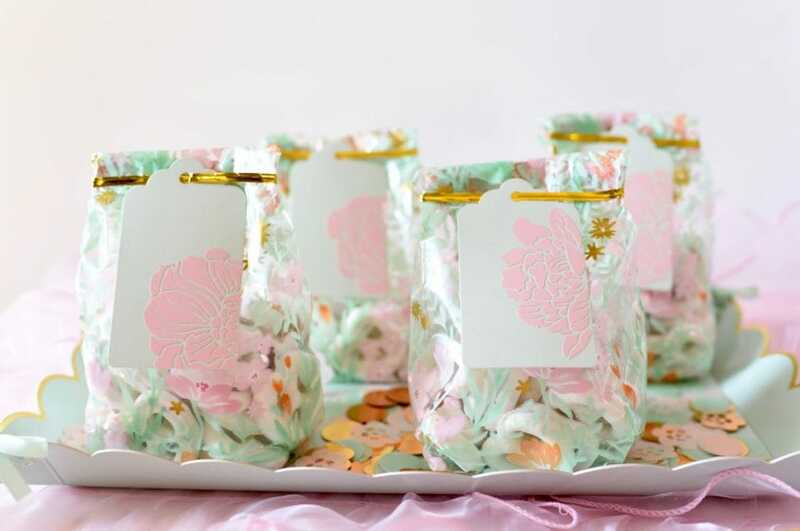 These favor bags are one of my favorite girl baby shower ideas! I love how well the tags coordinate with the bags and the cupcake dome. 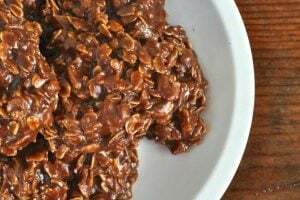 It all just ties in so perfectly together! I placed the baby shower party favors onto mint paper trays, then added some darling coordinating confetti in between the bags for some added color and fun. 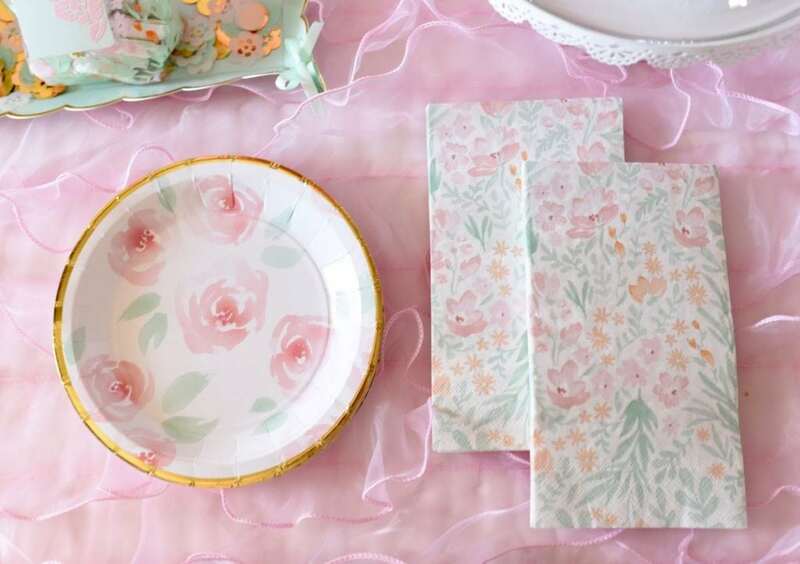 Matching floral napkins and plates look great with the rest of the mint, pink and gold baby shower. I made a simple baby shower banner for the front of the table. 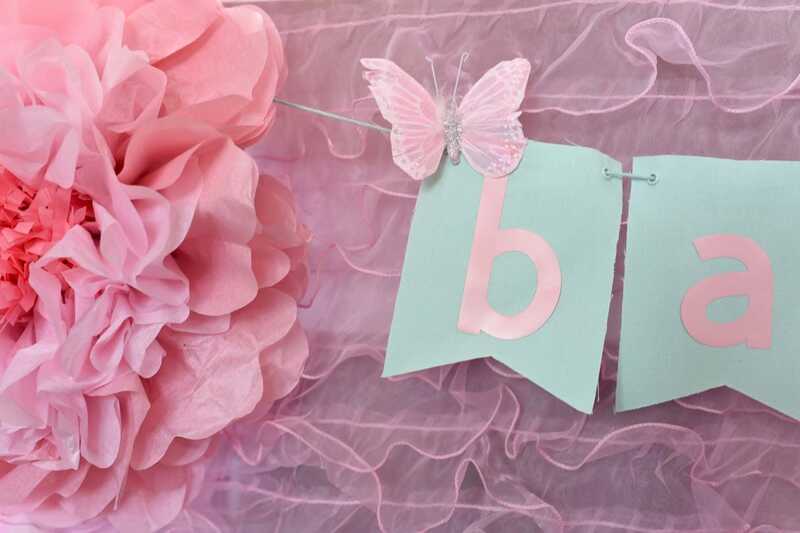 I used the canvas fishtail banners from Martha’s Mint & Blush line, then cut out the word BABY from blush Cricut vinyl. The vinyl is adhesive on the back, so I just stuck each letter on so that I could reuse the banners again for another party. You can get the banner free cut file HERE. 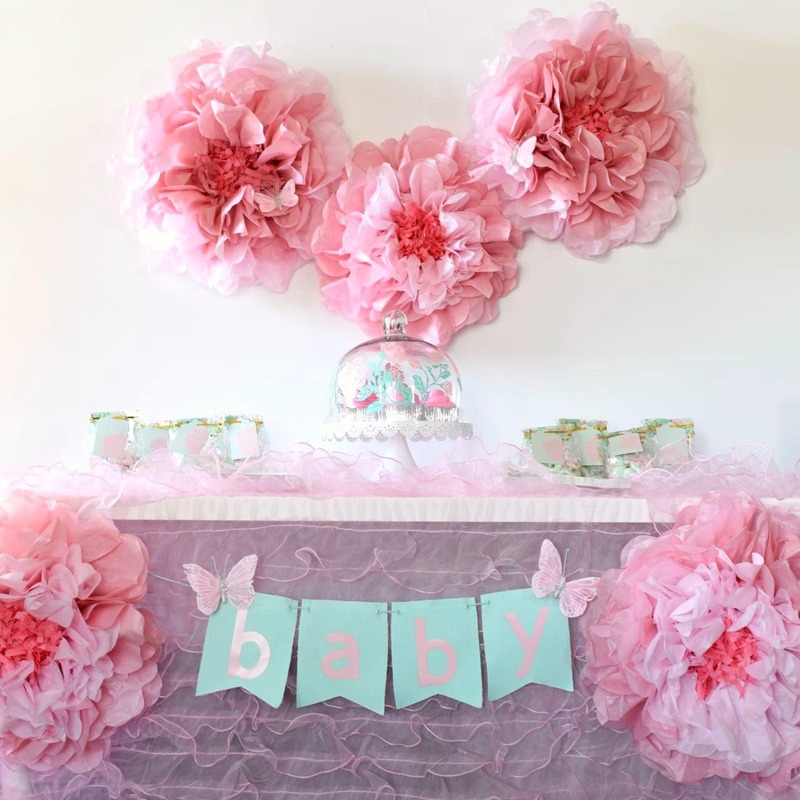 I already had these pretty pink butterflies, so I added them to the banner and a few to the flowers above the party table. 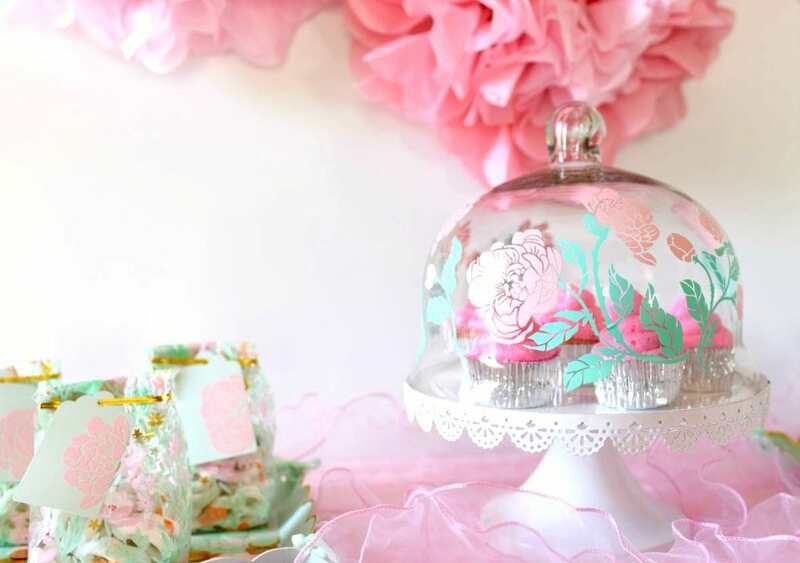 I hope you liked these girl baby shower ideas. It’s amazing what you can do with just a few supplies and a Martha Cricut machine. I use my machine to personalize everything from birthday parties to baby showers to t-shirts to baby onesies to Christmas gifts and more! 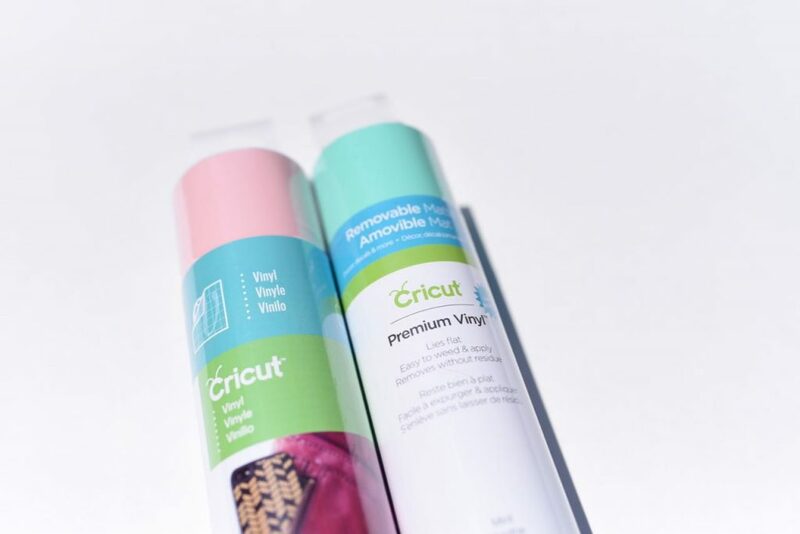 The Martha Cricut machine cuts and writes up to 2x faster than previous Cricut Explore models, which makes it my go to Cricut machine for creating. 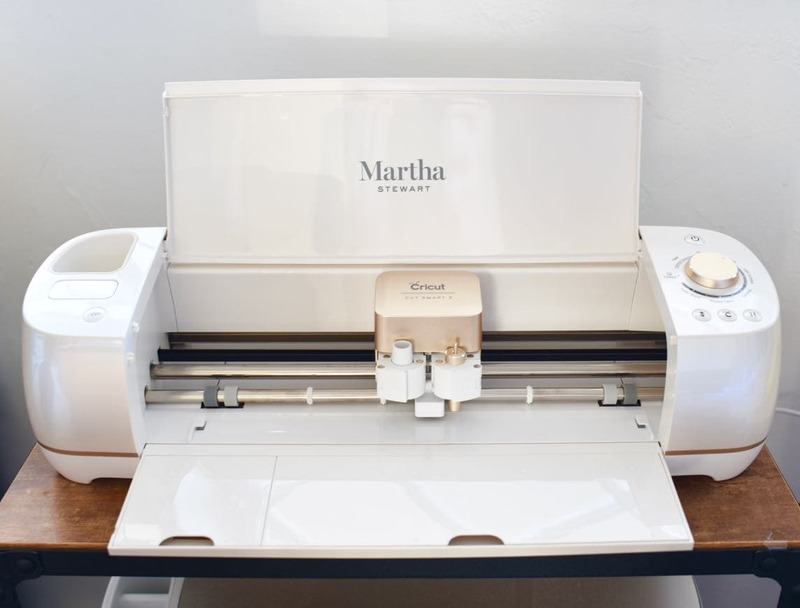 It also cuts over 100 different materials, including cardstock, iron-on, vinyl, glitter paper, cork, bonded fabric, and more The Martha Cricut machine comes with 25 exclusive Martha Stewart projects, plus a basic tool set with gold accents that I just love. This machine is exclusive to Michaels, and you can learn more about it HERE. It’s a fantastic (and gorgeous) machine!